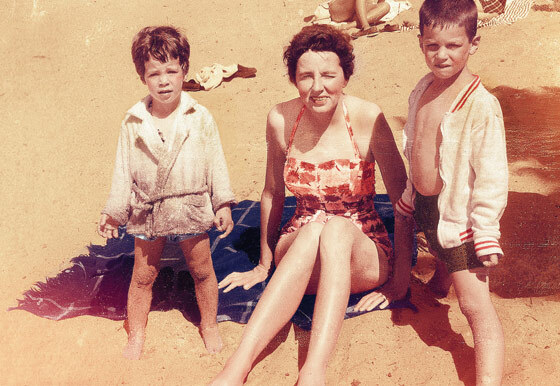 ← Taking Care of the Care Taker…..
From left, Nancy, Van, and Michael Wolff in 1958. On the way to visit my mother one recent rainy afternoon, I stopped in, after quite some constant prodding, to see my insurance salesman. He was pressing his efforts to sell me a long-term-care policy with a pitch about how much I’d save if I bought it now, before the rates were set to precipitously rise. For $5,000 per year, I’d receive, when I needed it, a daily sum to cover my future nursing costs. With an annual inflation adjustment of 5 percent, I could get in my dotage (or the people caring for me would get) as much as $900 a day. My mother carries such a policy, and it pays, in 2012 dollars, $180 a day—a fair idea of where heath-care costs are going. I am, as my insurance man pointed out, a “sweet spot” candidate. Not only do I have the cash (though not enough to self-finance my decline) but a realistic view: Like so many people in our fifties—in my experience almost everybody—I have a parent in an advanced stage of terminal breakdown. It’s what my peers talk about: our parents’ horror show. From the outside—at the office, restaurants, cocktail parties—we all seem perfectly secure and substantial. But in a room somewhere, hidden from view, we occupy this other, unimaginable life. I didn’t need to be schooled in the realities of long-term care: The costs for my mother, who is 86 and who, for the past eighteen months, has not been able to walk, talk, or to address her most minimal needs and, to boot, is absent a short-term memory, come in at about $17,000 a month. And while her LTC insurance hardly covers all of that, I’m certainly grateful she had the foresight to carry such a policy. (Although John Hancock, the carrier, has never paid on time, and all payments involve hours of being on hold with its invariably unhelpful help-line operators—and please fax them, don’t e-mail.) My three children deserve as much. And yet, on the verge of writing the check (that is, the first LTC check), I backed up. We make certain assumptions about the necessity of care. It’s an individual and, depending on where you stand in the great health-care debate, a national responsibility. It is what’s demanded of us, this extraordinary effort. For my mother, my siblings and I do what we are supposed to do. My children, I don’t doubt, will do the same. “Why do we want to cure cancer? Why do we want everybody to stop smoking? For this?” wailed a friend of mine with two long-ailing and yet tenacious in-laws. In 1990, there were slightly more than 3 million Americans over the age of 85. Now there are almost 6 million. By 2050 there will be 19 million—approaching 5 percent of the population. There are various ways to look at this. If you are responsible for governmental budgets, it’s a knotty policy issue. If you are in marketing, it suggests new opportunities (and not just Depends). If you are my age, it seems amazingly optimistic. Age is one of the great modern adventures, a technological marvel—we’re given several more youthful-ish decades if we take care of ourselves. Almost nobody, at least openly, sees this for its ultimate, dismaying, unintended consequence: By promoting longevity and technologically inhibiting death, we have created a new biological status held by an ever-growing part of the nation, a no-exit state that persists longer and longer, one that is nearly as remote from life as death, but which, unlike death, requires vast service, indentured servitude really, and resources. The traditional exits, of a sudden heart attack, of dying in one’s sleep, of unreasonably dropping dead in the street, of even a terminal illness, are now exotic ways of going. The longer you live the longer it will take to die. The better you have lived the worse you may die. The healthier you are—through careful diet, diligent exercise, and attentive medical scrutiny—the harder it is to die. Part of the advance in life expectancy is that we have technologically inhibited the ultimate event. We have fought natural causes to almost a draw. If you eliminate smokers, drinkers, other substance abusers, the obese, and the fatally ill, you are left with a rapidly growing demographic segment peculiarly resistant to death’s appointment—though far, far, far from healthy. Sometimes we comb my mother’s hair in silly dos, or photograph her in funny hats—a gallows but helpful humor: Contrary to the comedian’s maxim, comedy is easy, dying hard. Better plan on two years minimum, my insurance agent says, of this stub period of life—and possibly much more. Next: Why this is not just a drawn-out, stoic, and heroic long good-bye.